Want to watch a DVD while you doze off? Forget bolting a flat panel TV to your four-poster. If you want a real home theater in your boudoir -- and by real theater I mean a screen and a projector, not just a TV -- you want the Ruf Cinema Bed from Ruf-Betten. Described as the first multimedia bed, the Ruf has a fold-out screen tucked in the footboard (activated by remote, of course), and a shelf for a projector between the two plush headboards. There's also room for some DVDs, a DVD player, a conduit for cables and even a place to hide your subwoofer. Rockin! 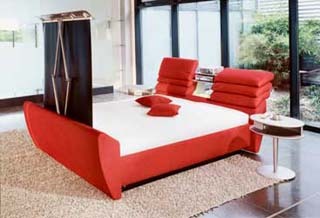 The bed is also pretty attractive in a modern-puffy-furniture way, though I imagine few are buying this for looks alone. Haven't come across pricing yet. Reminds me of an episode off The Jetson's. So the image is projected from the headboard... does it allow for snuggling? Hmmm. A projector about 12" from your head? Better find a VERY quiet projector and one that vents its hot air to the rear, unlike most which send their heat out the bottom or to the side. I have a projector embedded in the ceiling above my bed which bounces it image off a right-angle mirror at the ceiling level to a screen across the room. This solves the projector heat/noice problem. I don't see how they can overcome that with the design of this fancy bed.